WHY ARE WE AMAZON'S CHOICE FOR BLANKET BASKETS? Whether you're looking to keep a baby's room organized or add a warm touch to your homes decor, this versatile storage basket works well in any room. 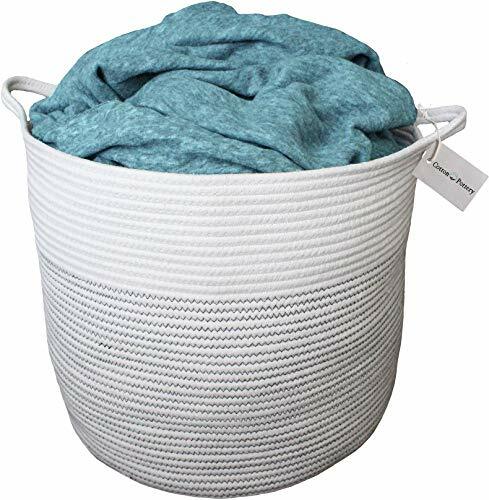 This extra large cotton rope basket is the perfect home decor item with various uses. Because the basket is hand stitched for extra durability and has woven in handles for easy moving, the basket is extremely versatile. We love designing products that look good and feel good. You can rest assured that this modern design will look fabulous in your home! We also take care to ensure extremely high quality in all of our products. At Cotton Pottery, we want to help you turn your house into a home. Check out the reviews and see for yourself! EXTRA LARGE STORAGE - The Cotton Pottery basket is designed to accommodate plenty of blankets, towels, toys, laundry, books, and more. Measuring 15 inches tall and 17 inches wide, it's made to be large for extra storage! VERSATILE DECOR - This stylish cotton rope basket is perfect for storage or decoration. The neutral color fits any color scheme and will bring a warm touch to any room. DURABLE & LIGHTWEIGHT- With reinforced stitching and sturdy slit handles, this decorative basket is dependable and great for everyday use. The lightweight and compact design make it easy to lift and carry. HIGH QUALITY - This cotton rope bin is beautifully made from 100% natural cotton rope, tightly woven and crafted to last for years. It's both soft and safe for kids/babies to give you peace of mind. Easy to clean and hand washable (care instructions included). 100% RISK FREE - Shop confidently with our replacement or money-back guarantee! We are so committed to our product that if for any reason you are not completely satisfied with your purchase, you can contact us within 30 days for a replacement or full refund. Seriously. No returns. No hassle. If you have any questions about this product by Cotton Pottery, contact us by completing and submitting the form below. If you are looking for a specif part number, please include it with your message.